The chief of the General Staff believes that Russia may deploy over 5,000 troops in Belarus. 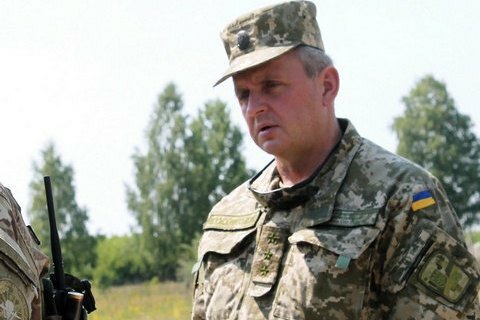 The head of the General Staff of the Armed Forces of Ukraine Viktor Muzhenko believes that a military offensive group can be created on the territory of Belarus under the guise of the West-2017 exercises. "We cannot rule out Russia may try to create advanced military bases with weapons and military equipment, which would enable the Russian Federation to promptly create new groupings as the need arises," Muzhenko said in an interview with LIGA.net published on 7 August. "Initially, it was announced the number of the Russian grouping will be at 3 thousand troops, now we see it nears 5 thousand. I think this group will be much larger. Which Russia will deny as usual"
Muzhenko recalled that three new divisions (144th motorized rifle, 3rd motorized rifle and the 150th motorized rifle) have already been deployed near the western border of Russia, which also bear signs of offensive formations. "So far, we do not see the creation of groups powerful enough to allow the Russian Federation, say, tomorrow or the day after tomorrow, to launch a large-scale offensive operation. However, their reformatting and an updated command system indicate that a possibility of conducting certain offensive operation cannot be ruled out," Muzhenko said. It is hard to say how massive this offensive can be, he said: "We examine and analyze all variants for the development of the situation: from local actions to a full-scale invasion." During a recent visit to Kyiv, Belarus President Alyaksandr Lukashenka assured that the territory of his country would never be used to invade Ukraine. Strategic exercises West-2017 will be held from September 14 to September 20 this year simultaneously in several training ranges of Russia and Belarus. When announcing the excersises, Russian Defense Minister Sergei Shoigu called them "the central event of joint training of Russian and Belarusian armed forces in 2017".